This is a perfect finishing hole playing towards a beautifully designed Thai style clubhouse with a magnificent mountain backdrop. The fairway is rolling forward with a parallel long fairway bunker on the right hand side. Your first shot should be aimed towards the clubhouse. The green is a little lofty and will need to concentrate when you are on the green as you may be greeted by a big audience at the club house restaurants terrace. This hole is claimed to have the largest green in the region. 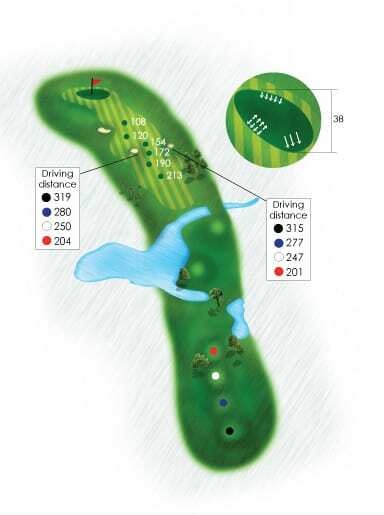 It’s a long Par 3 where the ball spends most of its time up in the wind. The hole is slightly upwards and the back of the green has been manicured to help you keep on it should you shoot slightly over. There is a very good chance for a birdie here. Often there is a lot of tailwind from behind so be careful with the club selection. A driver may not be suitable. Just left of the beautiful tree that decorates the fairway is where you need to be. 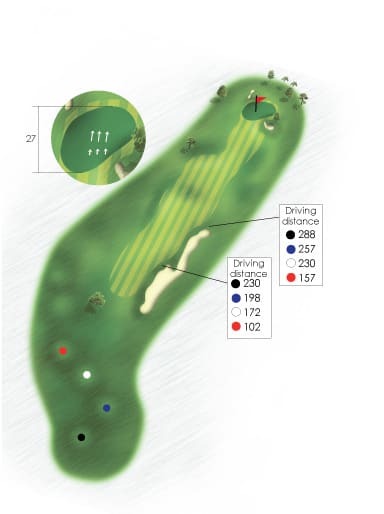 You should aim a little shorter rather than too far since the fairway becomes narrower the closer you are to the green. On the right side of this hole there is a stream winding its way beautifully up to the green. 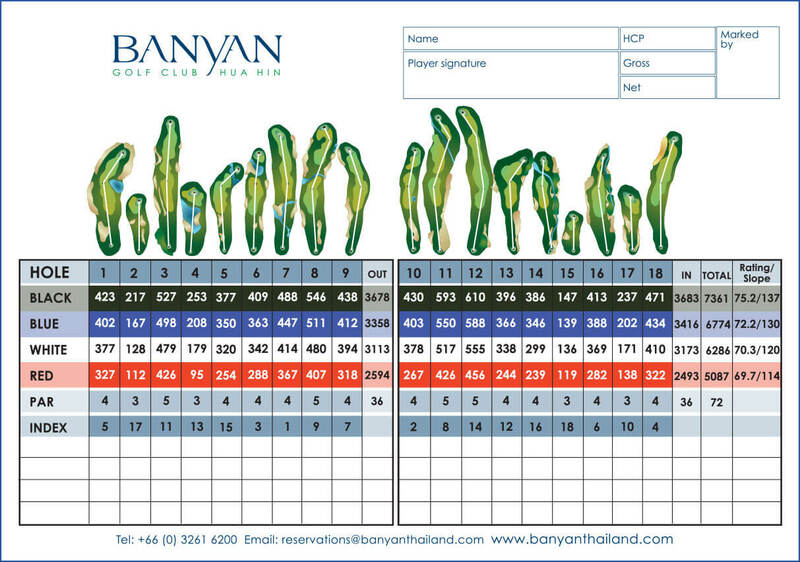 The Banyan Golf Club, Hua Hin’s signature hole. You will need to take a deep breath here as the elevated views from all the tee boxes are spectacular with ocean views to your left, valleys and mountains to your right. The hole is not far, but the wind will surprise you. 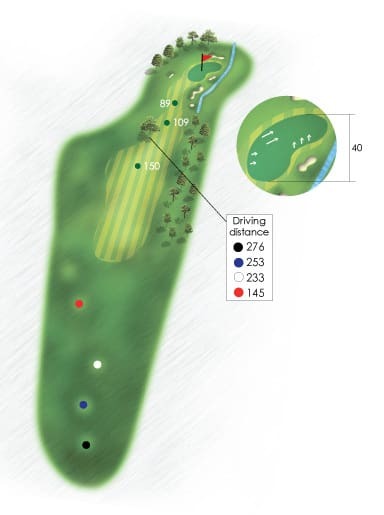 A par 3 doesn’t have to be far to be difficult. Here we have other factors that you have to account for. A very picturesque hole as from the tee can you see the stream and the waterfall that divides the fairway in to two parts. 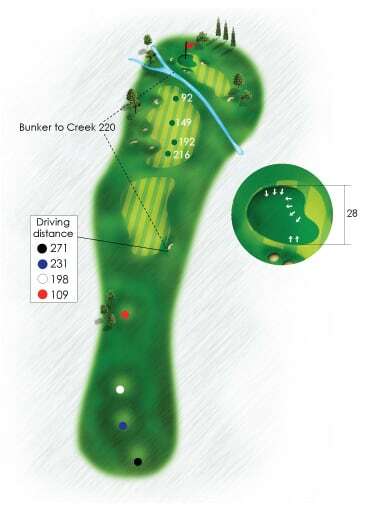 This hole tends to have quite a lot of head wind so a driver from the tee is a good option to take. A perfect drive and a small wedge left towards a large and lovely green. The fairway is leaning from the left toward the right side so the smartest thing is to keep to left side of the fairway. Parallel with the right side runs a stream that you rather avoid. 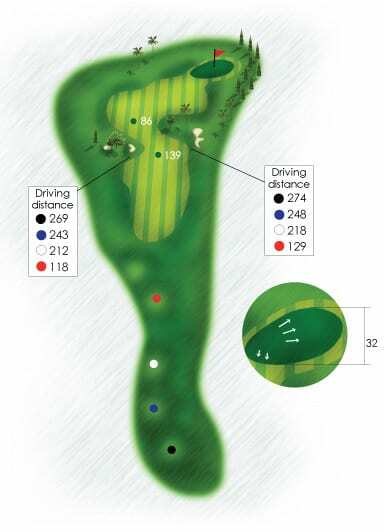 Dog leg right, keep to the left side of the fairway, otherwise the ball has a tendency to roll to the right. After the tee off there is not much club left, everything is downhill. The short game is towards a relatively small green, but there are no bunkers. Longest hole on the golf course with a slight dog leg left but are able to reach the green in two shots if the wind is behind you. This hole is wide and quite generous but need to look out for treacherous fairway bunkers when you get closer to the green with your second hit. Everything is leaning towards the left, so keep to the right, a little bit more then you would think. A slight slope downwards all the way towards the green. The fairway leans a little from left to right. It would take a well seasoned golf professional to be on the green in two here as it appears to be almost impossible. 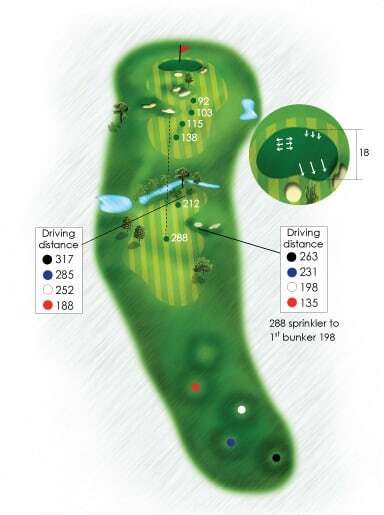 There are two alternate ways to reach the fairway with your second shot which is in parallel with a wonderful stream. 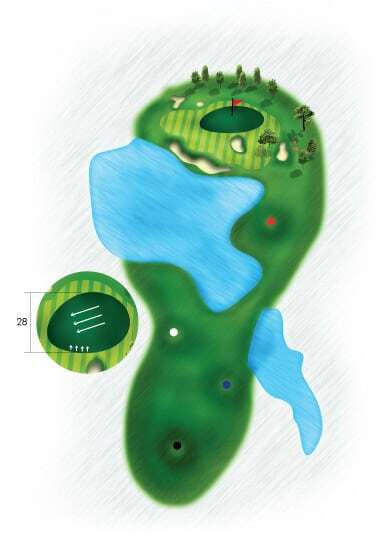 The third shot with a wedge to a tight green surrounded by bunkers is the next challenge on this hole. If you land on the green you have a great birdie chance! Rated as the second hardest hole on the golf course, but to many golfers perhaps the most difficult! You really need to concentrate with your tee shot here. 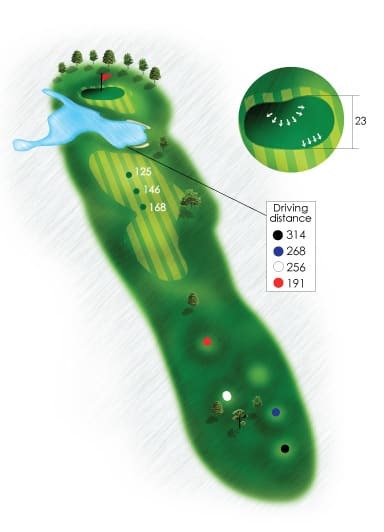 Aim to the middle of the fairway and the slope will take you to the left side of the fairway. Here you are in the perfect position for your shot onto the generous green. 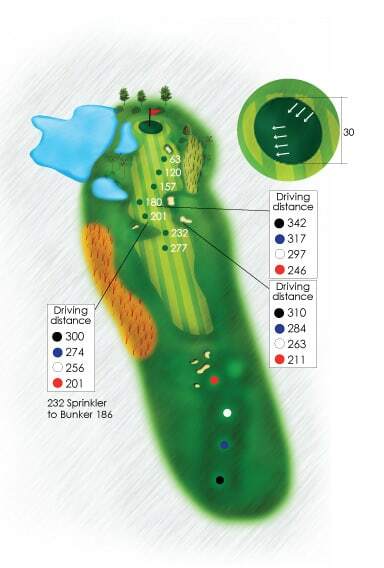 Because you are playing upwards all the way towards the green the hole is longer than you think. The fairway is surrounded by trees and bushes. If you are too much to the right or too much to the left chances are you’re in trouble. Once again are you standing high up looking over this magnificent golf course, the feeling is magic and you feel that the course must have been here for a long time. To bring back the pineapple plants, to plant this colorful bougainvillea and this cool red grass makes it feel very authentic somehow. This hole needs a little course management from the tee. 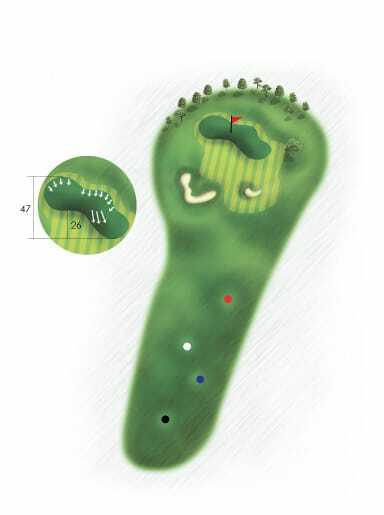 Avoid the right side which catches sliced tee shots with the help of two bunkers. 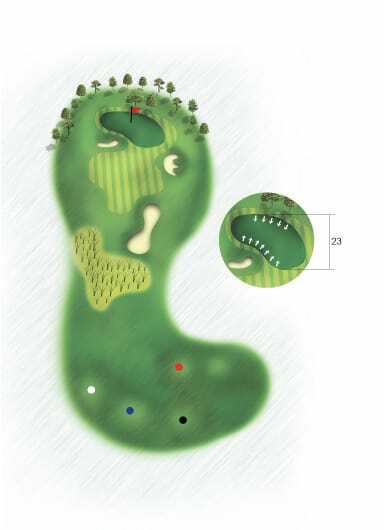 Even the second shot demands some planning to avoid the fairway bunkers that are strategically placed before the green in the middle of the fairway. 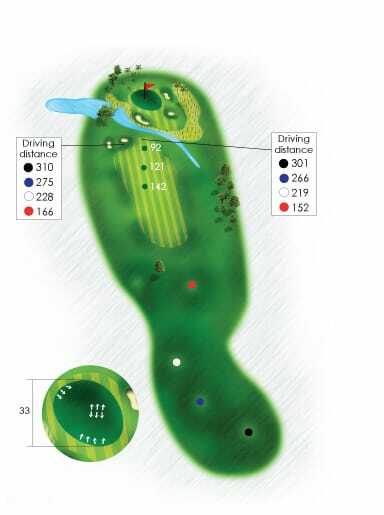 The green is rather small and wavy and you need to know how far you hit with your wedges. 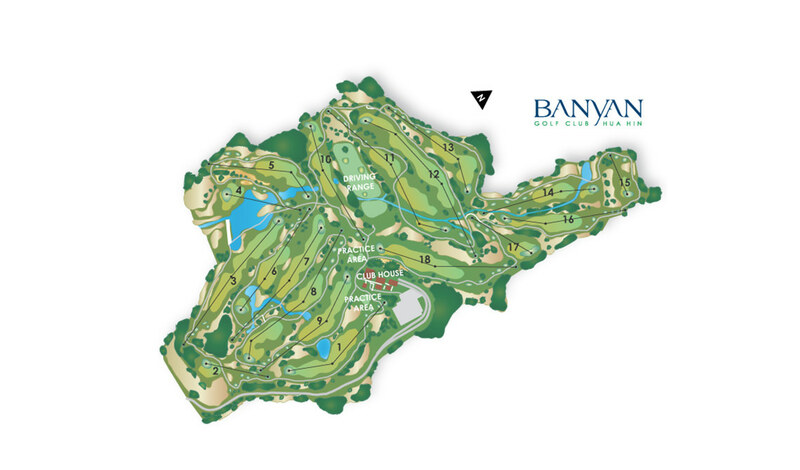 Rated by the golf course architect as the most difficult hole on the golf course – this may feel quite surprising as you make it up to the highly elevated tee box. From the tee box you feel a sense that you can make this on the green in two. You are able to select your landing areas as the fairway looks giving and then your second approach shot is free of any hazards. Good luck! A beautiful tee shot and on to the wavy fairway. A good driver brings you close to a very beautiful pond. The difficulty is in the second shot where you need to use at least one extra club. When you have holed out, look back to the tee box and appreciate the contours and land elevations. 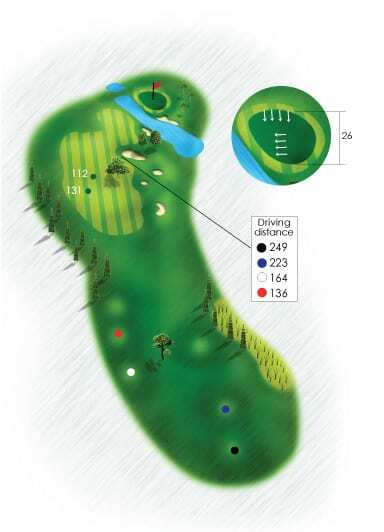 Dog leg right and aim to the left part of the fairway to get maximum length from the tee. The fairway leans from left to the right, where the difficulty is the short game which doesn’t come far after a good drive. 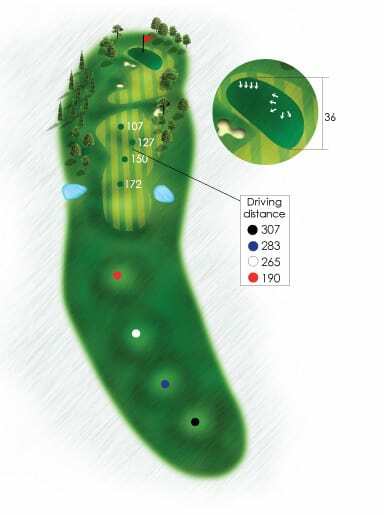 It demands a lofted second shot to reach over the stream from a fairway that is leaning a little from you. Instruction tip – the ball toward the back foot, more weight on the front foot! 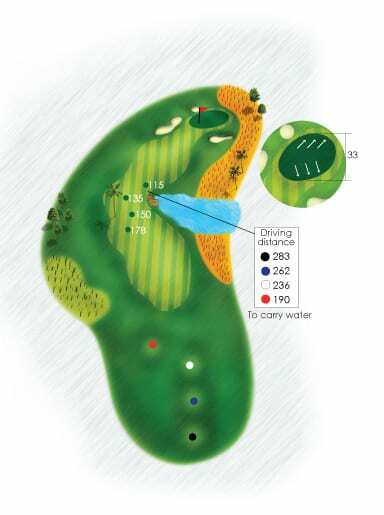 Tee shots must carry 150-yards to clear the water and to compensate on the other side is a large green. Certainly a challenge from the Black tees. Go for it, and celebrate the success at the Mulligan’s drink kiosk before making it to hole 5. Rolling fairways with a good drive downhill will help you get on the green in two. 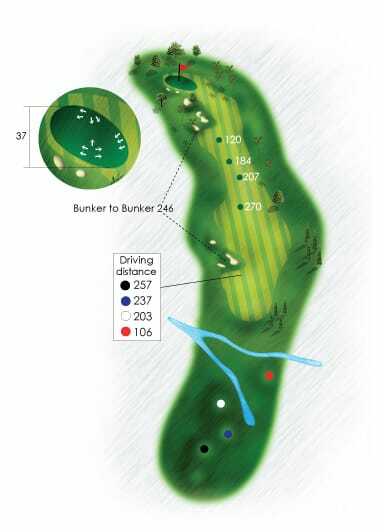 This hole is commonly selected for longest drive competitions. 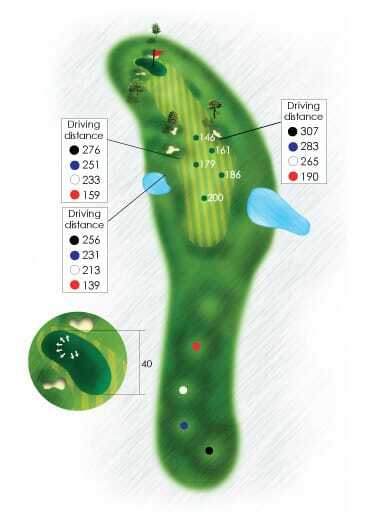 Wind from behind can make all the difference – it’s a great driving hole! The hole is varied and has fantastic views of the mountains in the background. An impressive large tree stands prominent to your left. Occasionally, strong Southerly winds can carry you slightly to the right. 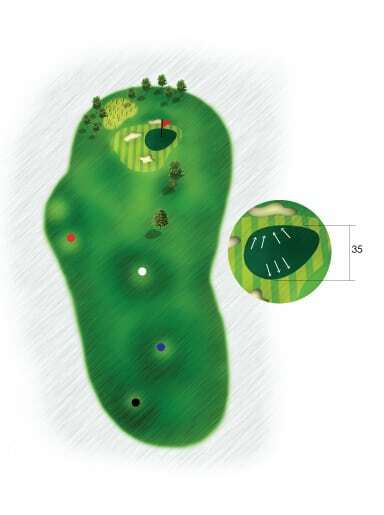 Putting from the back-left area of the green can present you with a challenge. It’s a wonderful starting hole. The elevated tee boxes provide you with superb panoramic views of the front nine. From the tee aim at the pineapple tree which will provide you with just about 150-yards to go with your approach shot. Water hazards and red grass to the right and several bunkers surround the greens.